Someone's out to get Louis Koo in Soi Cheang's Accident. The Skinny: Soi Cheang makes up for Shamo with Accident, a largely successful thriller with a fine central performance from Louis Koo. A convenient climax mars things somewhat, but on the whole this is a precise and compelling effort, and a worthy addition to the Milkyway Image ranks. On craft alone, this is one of the year's best. by Kozo: Slip in the shower recently? Well, it wasn't a random accident – someone was trying to murder you in the most circuitous way possible. At least, that's what Ho Kwok-Fai (Louis Koo) of the Milkyway-produced Accident (working title: Assassins) seems to be thinking 24 hours a day, 7 days a week. A paranoid thriller about hitmen who kill in roundabout ways, Accident was brought to you by director Soi Cheang, whose last film Shamo was as guiltily entertaining as it was bizarre and ill conceived. Accident hews closer to Cheang's Dog Bite Dog, restoring the director's tense storytelling style while eschewing the brutal violence that characterized his last two films. With some contribution from the Milkyway Creative Team (plus that Johnnie To guy, who serves as producer), Accident turns out to be a well-crafted thriller that's only marred by a sloppy and convenient ending. Up until that point, however, this is cinema par excellence. Ho Kwok-Fai (Koo) leads a three-person crew (Michelle Ye, Stanley Fung and Lam Suet), who we meet as they witness the public death of a middle-aged man. Ho's team indirectly goads the man into driving a certain direction on a crowded street before he ends up buying it in what looks like a random, unpredictable way. Of course his death was planned – Ho's crew set up the hit in an elaborate manner, such that there was no other outcome but the man cashing in his chips. However, a couple of things about their latest job make the team nervous. One, the victim was a mob boss, so there’s the chance of some reprisal if the accident is discovered not to be one. And two, aging team member Uncle (Stanley Fung) had a brain fart, dropping a cigarette at the scene containing traces of his DNA. The incident unsettles the team, an apparent long-standing tension amongst them bubbling to the surface. However, even before talking to his team about Uncle’s screw-up, Ho eavesdrops on their conversations, trying to gleam any hint of duplicity. He also refuses to accept food from his team and sets up his apartment in a paranoid fashion, such that he can tell if anyone has been snooping around. Clearly, Ho has trust issues. Ho’s lack of interpersonal comfort is understandable because he makes a living doing evil while also erasing all evidence of nefarious intent. Accident gets good mileage from the fear that “maybe accidents aren’t really accidents”, with the effect on Ho and his team rendered quite well. There’s a backstory that explains Ho’s trust issues, but the main details are fleshed out sharply by Soi Cheang’s deliberate style. Other than a few expository sequences, Cheang eschews dialogue for subtle character building, using controlled technique to create a tense and involving atmosphere. Cheang's storytelling frequently gives the impression that something sinister may be happening when perhaps nothing is happening at all. Accident possesses exemplary mise-en-scene, communicating wordlessly Ho’s increasing paranoia and single-minded personality through stark lighting, spare music, meticulous framing, and sharp art direction. There are long stretches in Accident where little seems to happen – such as the sequences of Louis Koo tailing or spying on someone – but the scenes are smartly paced, conveying the actual emotions felt by Koo’s character in an immersive manner. Whether there’s a payoff or not, Cheang makes the ride a fascinating one. Still, this is a commercially-released picture with a fairly big Hong Kong star, so the film has to amount to more than “Louis Koo follows someone around while looking unhappy”. The film does move towards a resolution after the team’s second hit goes spectacularly awry, when Ho starts worrying if the team itself may have sabotaged their assignment. Also, Ho becomes obsessed with Chan Fong-Chow (Richie Jen), a seemingly respectable yuppie who he believes may be the key to his team’s troubles. This new cat-and-mouse game lends itself to lots of observation and little overt revelation, but the conflict reveals parts of Ho's character that are illuminating. 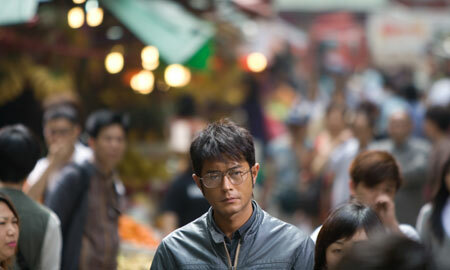 Credit goes to Louis Koo, who takes his twitchy, sweaty acting tics to a whole new level. Unlike the usual overacting that Koo engages in when playing paranoid or nervous individuals, Koo underplays Ho Kwok-Fai, keeping everything beneath an introverted, calculating veneer that slowly reveals cracks in his emotions and maybe even his psyche. It could be a breakthrough performance for Koo, whose acting cred has long been eclipsed by his tanned idol status. Michelle Ye and the great Stanley Fung have their chances to shine too, with some scenes between the characters proving intimate and tense. Richie Jen creates his character decently, but overall he's given few chances during the film to do very much.